The table illustrates the number of people a million who watch sports on television. It shows the specific figures for viewers for four sports in four different countries. Overall, it is clear that Americans watch sports on the television more than the other three nations and tennis is the most common sport which people prefer to watch. The total number of viewers for tennis is nearly 26 million people and in each country about 6-7 million people watch it. On the other hand, in the USA, golf is the sport having the most people watching 11.2 million, but it is not as popular as in the other countries. n the USA and Canada only 1-1.5 million people watch motor racing while it is more popular in the UK and Australia ( 6,4 million people and followed by 3,7 million people respectively). Finally, 5.5 million Americans are into watching athletics on television, while 1 million less British fans enjoy this sport. Below 4 million in each of Canadians and Australians watch athletics on television. Please attach an image of the table you are writing about. 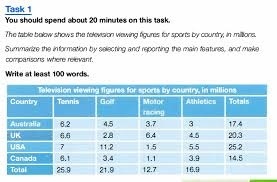 The table gives the numbers (in millions) of people in Australia, The UK, the US and Canada who watch different sports (tennis, motor racing, golf and athletics) on television. The table also shows the totals by country and by sport. Overall, 77.4 million people watch sports of TV in these countries. The population of the US and the UK is 325 million and 65 million respectively. In the US, there are 25 million viewers and in the UK there are 20 million viewers. So one American in thirteen (8%) watch these sports on TV but one in three UK citizens (33%) do. Actually it is much more common among Australians. With a population of 24 million, 17 million (70%) watch these sports on TV. You must be VERY careful in writing exactly what is in the table. There are more viewers in the USA (25 million) than in the other three nations. A better statement is this one because it has calculations! Nearly one third (32.5%) of the viewers are in the United States with about 25%  in the UK, 22% in Australia and 18% in Canada. and tennis is the most common sport which people prefer to watch. The total number of viewers for tennis is nearly 26 million people and in each country about 6-7 million people watch it. On the other hand, in the USA, golf is the sport having the most people watching, 11.2 million, but it is not as popular (Popularity is measured by the percentage of people who like something, not the absolute number.) as in the other countries. n the USA and Canada only 1-1.5 million people watch motor racing while it is more popular in the UK and Australia ( 6,4 million people and followed by 3,7 million people respectively). Finally, 5.5 million Americans are into watching athletics on television, while 1 million less British (wrong word) fans enjoy this sport. Below 4 million in each of Canadians and Australians (wrong form) watch athletics on television.